This entertaining and well-structured book is an ethnography of the New Domesticity movement which the author sees as sweeping America. The main descriptive chapters provide a wealth of anecdotes and case studies from Emily Machtar’s interaction with individuals—mostly women—who have embraced one or more aspects of this trend. Key chapters are devoted to the growing population of domestic bloggers sharing their reclaimed domesticity with sometimes lucrative results; the new knitters and crocheters flocking to Etsy the online craft marketplace; and the “femivores” who pride themselves on cooking and eating what they have also produced. Important sections are also dedicated to “attached parents” who wear their babies (as in “babywearing”), sleep with them, never let them “cry out,” and insist on homeschooling; and to the rise of “homesteading” which combines all of the above, and in principle though less often in practice has a clearer role for men. Since many individuals embrace several dimensions of the new domesticity there is inevitably some overlap between these ethnographic chapters which could have been shortened, but the lively narrative draws the reader inexorably along. Fears that the author’s empathetic reportage will tilt into a sales pitch are regularly quenched by her steely eyed glimpses into Trouble in Paradise. Very few lifestyle bloggers, for example, make any money; and she is stoically unconvinced by reuseable toilet tissue. The voices of the people Ms. Matchar talks to are vividly conveyed, but she may want to consider using less vernacular in her own words. This would support the seriousness of her arguments and might prevent the text from dating so quickly. The use of “crunchy” and “crafty” particularly stand out as needing a re-think. Isn’t “crunchy” best kept for preferred food of the referenced individuals? And “crafty” is not normally used to describe people who are skilled in craft (the Arts and Crafty Movement of the Late Victorian period?) though of course some of them may be crafty, too. But these are minor quibbles. 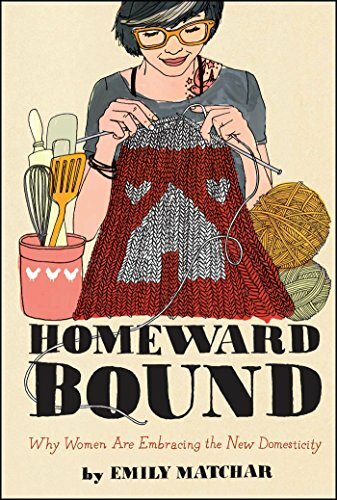 The descriptive heart of the book is bracketed by introductory chapters that consider other eras when homemaking has exerted an unnatural pull, as well as an excellent final chapter offering some lessons learned from her investigation of the varied aspects of the new domesticity. An obvious early parallel was chronicled by Betty Friedan in her 1963 classic The Feminine Mystique, and perhaps Ms. Matchar could have made more of the contrasts and comparisons between then and now. Friedan showed quite persuasively—though perhaps at too great a length—how the media and other elements in society conspired to glorify homemaking as women’s work when they became surplus in the workplace after men returned from the war. The final chapter with its recommendations is a breath of analytical fresh air where the author formulates five common sense responses to what she has learned noting first that the “essential” nature of the new domesticity places most of the burden of work squarely back on women’s martyred shoulders and so reverses the enfranchising of men which needs to go forward rather than backward. Drawing together earlier arguments she states quite clearly that the financial independence of most of her interviewees is a myth as they are all reliant to some extent on their own salary or that of a partner or on family money. Trying to become financially dependent is also a retrograde, dangerous, and unsustainable step for individuals and families and the new domesticity still has more than a tinge of middle class privilege. Last but not least, this movement with its emphasis on self-reliance and going off the grid rather hypocritically claims to reject society instead of taking responsibility for changing it. As Ms. Matchar says “I hate to be an annoying liberal, who brings up how great things are in Sweden, but there you have it.” Strictly speaking Ms. Matchar might be safer citing Norway these days, but her point is still very valid. Jane Haile is currently an Independent consultant on women’s empowerment and gender equality. Her vast global human rights experience includes a variety of assignments working for the United Nations and the European Union. She is a Fellow of the Royal Anthropological Society, London, U.K., and her writing has been published by several academic presses.